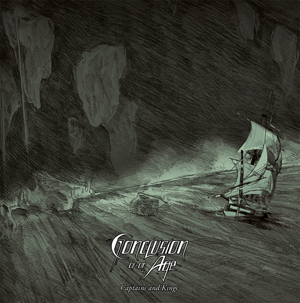 This summer CONCLUSION OF AN AGE already convinced critics and fans with their first compositional full-length masterpiece Captains And Kings, released by Dr. Music Records. Now they get the chance to come a lot closer to the power and the performance of the German newcomers! Thanks to the impressive music video for “Tyranny Falls”, that is bursting with energy, we get a direct insight into the studio work of the five youngsters in their early 20s. Straight forward and with a forceful sound not only guitar lovers will enjoy the music. If you like AVENGED SEVENFOLD or TRIVIUM, you will get a real kick out of “Tyranny Falls”! Until now even the last Metal fan should know that CONCLUSION OF AN AGE know their craft, but how do the guys act in their natural habitat, the studio? The video, produced by Limlights Productions, shows the five musicians completely enthusiastic and ambitioned. Watch the video now on KNAC.COM HERE. In a charming way the band’s story started during their school days with a shared musical interest in the game Guitar Hero when the five friends Kevin Di Prima (vocals), Michael und Julian Kaiser (guitars), Micha Mangold (bass) and Philip Deuer (drums) imitated their idols METALLICA. At last a serious, fresh Melodic Metal spectacle turned out from this constellation which shows since the first demo in 2014 how the future of the German Metal scene can and will look like. Thrilling guitar riffs paired with powerful drums and the striking voice of Kevin Di Prima ensure that the concept of CONCLUSION OF AN AGE kindles enthusiasm from the first second. Produced by Timon Seidl at the Red Audio Studio and mastered by Miro Rodenberg (EDGUY, KAMELOT, BRAINSTORM) at the legendary Gate Studio, the musicians are up for a great start thanks to their right feeling for the perfect combination of melody and powerful energy. The ingenious Melodic Metal debut album Captains And Kings is available at most download stores and streaming services. All of the important info about the German Modern Melodic Metal hope, that already rocked the Metal Hammer Paradise Festival as the winners of the band contest, can be found HERE. Further background information as well as the latest news can be discovered on the CONCLUSION OF AN AGE website or at Facebook and Instagram.